When a railroad needs to turn a train or locomotive, it has three options: a turntable, a reverse loop (sometimes called a balloon track) and a wye. The first two are well-known and often used by modelers. The wye is perhaps lesser understood but has great potential for model railroads. Like the other turning tracks, the wye gets its name from its shape—three "Y"s connected to each other. Often the turnouts used on at least one of the branches of the wye will be "Y" shaped as well. But this is not a requirement for the prototype or model railroads. Wyes are commonly found around terminals and also at the end of branchlines. They are also commonly used at junctions to allow trains to traverse alternate routes. A wye is much cheaper to build and maintain than a turntable, yet it requires less space than a reverse loop. Depending on the size and location of the wye, it can be used to turn an entire train or just a single locomotive. If the tracks are long enough, the wye can also double as a run-around track. Spotting the train on one leg of the wye between the switches, as the locomotive negotiates the other two legs, it will end up on the other end of the train, facing forward again. This little trick can be a great move at the end of the line. A wye can take several forms. All three "legs" (the track sections between the switches) can be curved, or perhaps only two will bend. The "tails" (the tracks extending beyond the switches) need to be as long as the longest thing that will be turned on the wye. The may be just enough for a locomotive, or if the wye is at a junction, all three lines may continue for miles. A variation of the simple wye is the "scissors wye." On a scissors wye, two of the legs cross each other before coming together. This can be used to lessen the footprint of the wye where space is limited. While the size, radius, and shape of the wye can vary, one thing for sure you will need is three switches. One or more of these can be of the "wye" type—or none at all. A wye switch can greatly reduce the amount of space needed for the wye and in other applications around your layout too. If trains only move in one direction around the wye, you could install spring switches at each turnout to automate the operation. These switches will automatically spring over to the next route for the train as soon as the last wheel passes. For DCC equipped layouts, you could also install a switch decoder with an auto-throw feature for the same results with powered turnouts. The diagram above shows the general layout of a "typical" wye. The tail tracks could be extended as much as desired in any direction. In addition to the track arrangement, notice the two red marks near the top switch. These mark the location of insulated joints that will be required for two-rail DC or DCC operation to prevent a short. 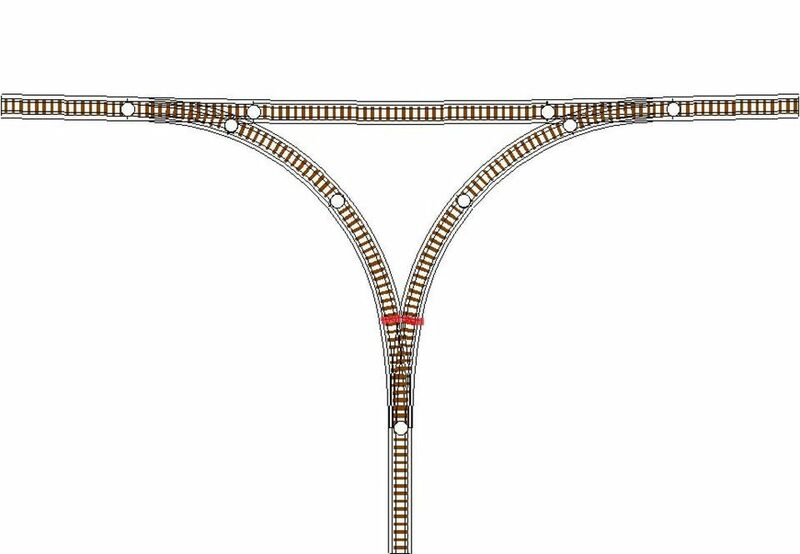 One challenge for most modelers with wyes and other reversing sections is preventing an electrical short when rails of opposite polarities meet. There are several ways to handle these shorts, from simple toggle switches to automatic reverse units. The latter are available for use with most DCC systems. For more detail on solving this problem, you'll need to research reverse wiring sections. The wiring process is the same for all types of reversing tracks, the only difference is where you place the insulated gaps. An alternate location to insulate the wye would be to place the insulated joints at both ends of the same leg of the wye. In other words, the polarity of the rails would be the same on all three tail tracks. This method is most useful in places where the wye is part of a junction and reversing polarity on a rail track is not a practical option. Three rail AC-powered trains (common in O Gauge) don't face this problem. Like the prototype, you'll probably find many ways to incorporate a wye into your layout plans. As in real life, they are much cheaper than adding a turntable and take up a lot less space than a reverse loop. Just keep an eye out for the reverse circuit, and you'll be turning your trains in no time.